Just when we thought it couldn't get any more scenic, it did. 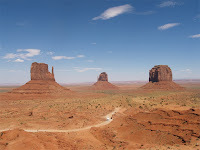 Leaving New Mexico, we passed so many fascinating formations along the way, and then we saw the Monument Valley monoliths on the horizon. What a show! The colors, shapes, size, and concentration of it all is mind boggling. From there we headed to Lake Powell, looking for accommodation in the town of Page. The hotels I found online were too pricey (even the Motel 6 and Super 8! ), so we decided to wing it. We lucked out with a last-minute special at the Holiday Inn Express, paying only $85 per night ($20 less than "normal"). Then we headed to dinner at the Mexican restaurant on Lake Powell Boulevard (which advertised the "best Margaritas in town"). Dinner was tasty, and afterwards we headed across the street to the park and playground to blow off some steam. Lukas loved the slides, but most of all, he loved climbing up to them on his own. He's getting so independent! In the morning, we headed out to Antelope Canyon with one of the various tour operators (since it's on a reservation, you must have a guide to view the canyon). Antelope Canyon is what's known as a slot canyon, and at about $30 per adult, it was worth every penny of our tour. The canyon is just incredible. It's nature at it's absolute best! Dinner that evening was at The Rainbow Room, a restaurant at The Lake Powell Resort, overlooking the lake and mountains. It was also my first time driving over the dam (have those cameras ready!). On our last morning, we headed back out to the lake (about a 10 minute drive), for a bit of swimming before piling into the car. The water was warm and Lukas had a blast, which is just what we hoped for! 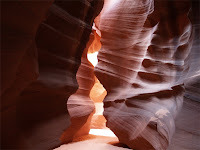 Antelope Canyon is at once one of the most breathtaking and tranquil places on earth. Gently carved from the Navajo sandstone over the course of countless millenniums, the slot canyons are majestic and narrow passages, just enough space for a small group to walk the sandy floor - and for the occasional shafts of sunlight to shine down from above.